Hair loss, or alopecia, is a difficult condition to treat. There are many reasons for hair loss, and so, there are many different ways to try to solve the problem. Some may offer greater benefits than others. As hair loss, particularly in men, can impact the person’s self-esteem, to discover you are losing your hair can be a very emotional experience. Not surprisingly, some people will pay almost any price to hold onto – or try to hold onto – their hair. This means vulnerable people are ripe for the picking when it comes to various pills and remedies on the market that may or may not actually do any good. That is not to say that all medicines being promoted as helpful for hair loss are without benefit. There are some pharmaceutical medicines that have been found to trigger hair re-growth, and some natural herbal treatments for alopecia that have also demonstrated great results. Combinations of Chinese and Western herbs are being further researched for their effect on hair growth, quality, lustre and scalp health. In men, the most common cause of hair loss is androgenic alopecia. It occurs because a male hormone, DHT (dihydrotestosterone), causes some hair follicles to shrink, so they can no longer support hair growth, and eventually disappear. (This hormone is not the same as testosterone). Curiously, this same hormone, DHT, is responsible for the increased growth of hair in the ears and noses of men as they age. There is a pattern to the way hair falls out as a result of androgenetic alopecia. It tends to happen in circles (or clumps). They result in small patches of baldness, and eventually this series of bald patches covers the dome of the head. Often areas of hair growth remain at the back and sides of the head. (Hair for transplantation is taken from these areas and replanted into the bald places, where it then continues to grow). Women also experience hair loss, though hair thinning is more common than total baldness. For women, hormonal changes such as menopause, thyroid issues, and vitamin deficiencies can be triggers for hair loss. 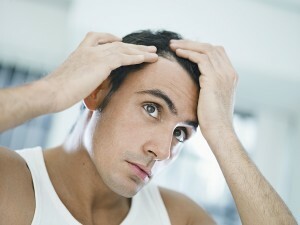 Stress, protein deficiencies and anaemia can also be responsible for hair loss in some people. Illness, chronic or sudden severe illness, can also cause hair loss. The side effects of some pharmaceuticals, or chemicals exposure, can also result in hair loss. Chinese medicine has a different way of looking at hair loss. Rather than treating the site of the problem – the head – Chinese medicine practitioners look to treat the deficiencies in the whole body system, seeing the condition, hair loss, as a symptom of imbalance elsewhere in the body. By improving the quality of the Blood, and replenishing energy in Kidney and Liver, the by-product can be hair re-growth. Certain Chinese herbs are used to achieve this, one of them being Fallopia multiflora (Polygonum) root. There are many others that also support Kidney and Liver energy and nourish the Blood. Other natural herbal treatments for hair loss (alopecia) include: Stinging Nettle, Saw Palmetto, Gingko Biloba, Horsetail and Panax Ginseng. Research shows some of these work by inhibiting the conversion of testosterone into DHT, or by providing DHT inhibitors, while others improve circulation and blood flow to help deliver greater nourishment to the hair follicles. There are a number of natural treatments for alopecia that may actually have no impact on hair re-growth but can improve the health of hair that remains, in terms of thickness and lustre.